We’re very excited to announce that EVRYTHNG and Recycl3R have established a new partnership to transform the way that consumer packaged goods are recycled. 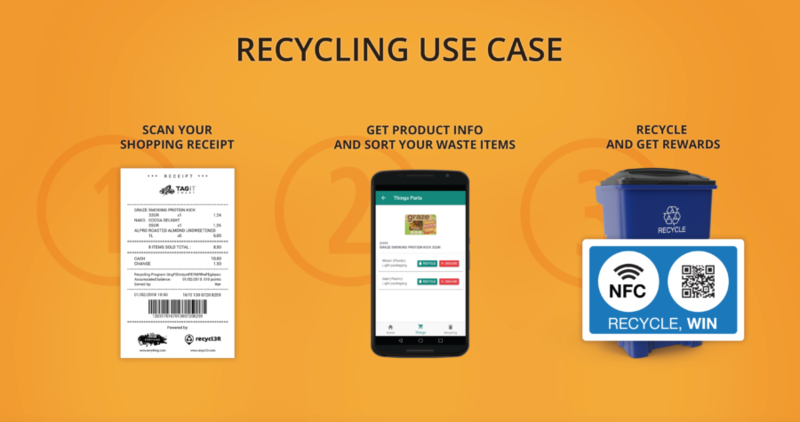 By combining the capabilities of EVRYTHNG’s Smart Products Platform with the recycling information service developed by Recycl3R, CPG brands and retailers can now boost consumer engagement and trust, by providing clear recycling information to consumers through smart packaging, and then by rewarding good recycling habits. 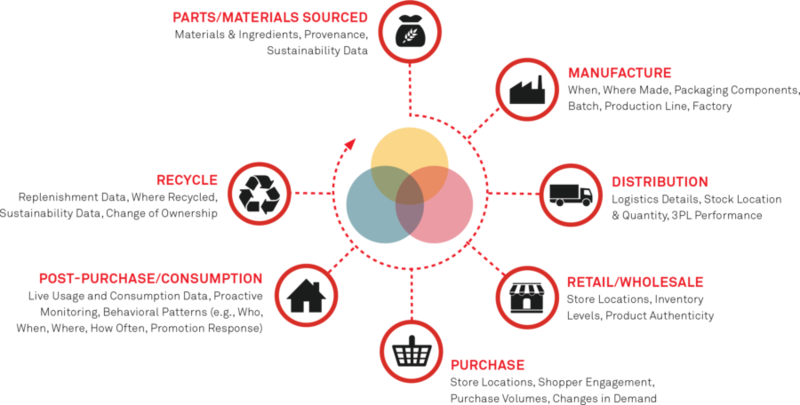 At the same time, thanks to item-level tracking and business intelligence, brands can get new insights through the product lifecycle, from sales and distribution to use and disposal. It’s no surprise that many companies (especially those in the FMCG business) spend a significant amount of their annual turnover in consumer engagement strategies. However, winning trust and loyalty has proven to be a difficult task for brands, as they have little direct connection with their end consumers after purchase. Figure 1: EVRYTHNG and Recycl3R are powering the last stage of the product lifecycle. At EVRYTHNG we give a unique digital identity, called an Active Digital Identity™, to every single item, and help revolutionize product lifecycle management. Defining how to reach out to consumers throughout the last phases of the lifecycle — from purchase to recycle — is key for differentiation and has huge potential for brands, producers, and retailers. This potential comes from providing insights on various types of interactions happening with products, and by prompting consumers to recycle and engage in socially responsible consumption. Let’s face it, recycling is not as easy as it should be. The recycling scene is fragmented, and regulations are typically not uniform or standard, even within the same region. Brands do not have a unified way of communicating with consumers about how to recycle, making it hard for individuals to engage in the task. Information about packaging and the corresponding recycling schemes is often obscure and not intuitive. This is where EVRYTHNG and Recycl3R come into it. We’ve created a solution for the recycling ecosystem, involving brands, retailers, councils and consumers, which leverages advancements in technology – specifically with connected packaging – to make recycling easier, and more transparent. We’re launching our solution with brands, retailers, and other industry partners in three locations; Merseyside in the United Kingdom and Logroño and Palma de Mallorca in Spain, where the solution will be tested throughout 2018. Scan their shopping receipts to import their products into a mobile recycling app. Sort their items at home. Through the mobile app, consumers can access information on where, when, and how to recycle the different parts of each product they bought based on their local schemes. Recycle their items in street bins or preferred recycling centers. Consumers can then register where they are recycling by scanning or tapping identity tags on recycling units, earning them rewards. Take a look at this quick video to see how it will work. We’ll bring you progress and insights from the pilots in an upcoming blog, and in the meantime, if you want to join our pilot program, please get in touch. This partnership and the work towards the solution has been made possible thanks to the TagItSmart research project (www.tagitsmart.eu), where EVRYTHNG is taking active part as the Smart Products Platform provider.